There was a church here at the time of the Domesday Survey (1086). The church was originally dedicated to St. Margaret and contained four guilds, St. John’s, St. Margaret’s, St. Mary’s and St. Peter’s. There was also a light in the churchyard called St. Mary’s light. The earliest recorded vicar is Andrew de Fordham in 1213. 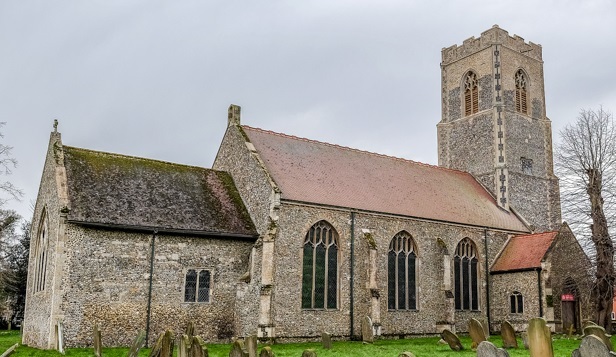 In 1348 the church, Rectory Manor and major part of the glebes were appropriated by William Bateman, Bishop of Norwich, to the Prior and Convent of Buckenham. There were new bells in 1446. The tower and a large part of the church were rebuilt of flint and freestone about 1477 and it was then rededicated to St. Peter and St. Paul. A guild was erected to their honour. In 1492 William Ferror was a benefactor to the guild and in 1495 to St. Mary’s light. The emblems of St. Peter and St. Paul, crossed keys and swords, can be seen at the base of the tower. The font bears an inscription”Ao DOM 1568 WAS THYS STEPLE TOPE NEWE SET UP TO THE GREATE COST OF LANDED MEN”. It is believed this refers to the completion of the tower or the rebuilding of the battlements. In 1679 following a survey the chancel was found to be in a ruinous state and Doctor Owen Hughes, Commissary to the Bishop sequestered impropriate tithes to repair it. The Bishops or Archdeacons had the power to sequester tithes if the owners or their farmers refused or neglected to repair the chancels. Rev. George Crabbe records that in 1679 the chancel had an oak roof ornamented with “quasi Jacobean carvings” and that this was still in “fair preservation” in 1865 but was destroyed and replaced with a deal roof. Blomfield wrote in 1805 that the windows were “formally very fine but now imperfect”. A south chancel window contained an effigy of one of the Caston family and an effigy of Sir Simon Palmer was contained in a north church window with his arms and the arms of Ormesby and Mortimer. In another north window a priest was shown preaching to a large congregation, some with the word Jesus coming from their mouths. The west window once contained painted glass depicting the devil, with cloven feet and asses ears, sitting on a throne wearing a crown and purple robes. A crowd of people and kings were rushing toward the devil and above them smaller devil with long ears and tails. In 1848 the tower was re-pointed and the west window, which had been partly bricked up, was opened up cleaned and re-glazed. The tower was given a new roof and leaded in 1849 and the bell beams were given new supports. Mrs Ann Barker, Lady of the Manor, supplied the timber. Major restoration was carried out in 1883-4. the south wall, which was fourteen inches ( 360 millimetres) out of perpendicular, was rebuilt and the nave re-roofed. The whole nave was refurbished and fitted with new pews. The architect was John B. Pearce of Great Yarmouth and the builder Joshua F. Simpson of Swaffham. The cost was about £1560. The windows were re-glazed with cathedral glass in 1875 but a small amount of fourteenth century glass was retained. This was restored and installed in two of the south nave windows by Rev. Frederick Sutton of Brant Broughton, Lincolnshire in 1887. The four bells were recast in 1896 and a fifth bell, given be a friend of the vicar, was added. The churchyard wall on the west side was rebuilt in 1898, the work being done by one man. Electricity was installed around 1949-50 and an electric blower replaced the hand pump for the organ relieving the many young people who had been called on to pump the organ. In more recent times the church had again fallen into a bad state of repair. However a programme of repairs began in 2008 with repairs to the chancel followed by re-tiling of the nave roof, installation of new gutters, downpipes and drainage. In 2015-16 repairs were carried out to the flint and stonework of the tower, new louvres installed, decayed pew floors repaired and new lights installed.